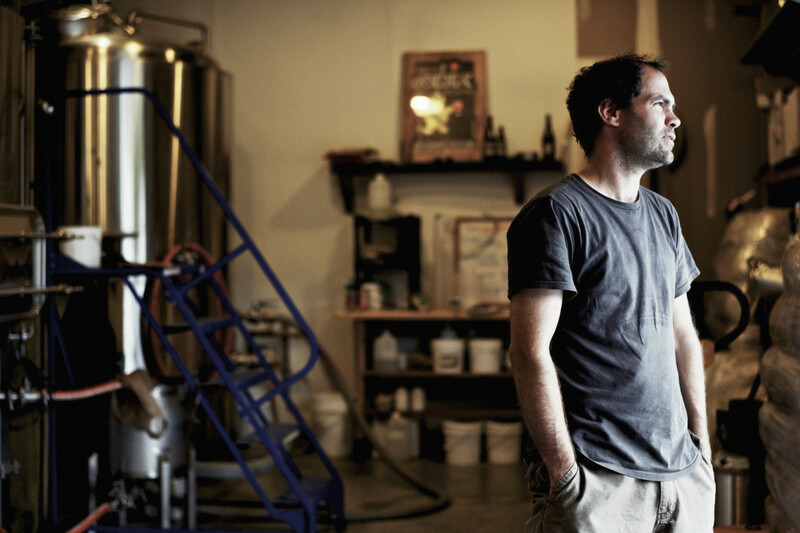 Shaun Hill of Hill Farmstead on brewing beer to capture the imagination. Shaun Hill is the founder and CEO of Hill Farmstead in Vermont, who are, for me, one of the most imaginative breweries in the world. Based on the farm that has been home to his family for over 230 years, Hill Farmstead’s mission statement is “to hand craft succinct, elegant beers of distinction and to revive and diversify the farmscape of the Hill Farmstead in Greensboro”. His beers are usually at, or close to, the top of Ratebeer, making them among the world’s finest, and most revered beers. Among many one-off beers, Hill Farmstead produce 2 key series of beers, the Ancestral Series and the Philosophical Series. The Ancestral Series honour his different relatives who are connected to the land, such as ‘Abner’, named after his great grandfather, ‘Anna’, named after his grandfather’s sister, and ‘E’, short for Edward, his grandfather. Hill Farmstead in the winter. The Philosophical Series (which he talks about more here) reflects Shaun’s longstanding interest in philosophy, with beers such as ‘Beyond Good and Evil’, ‘Fear and Trembling’ (a quote from Kierkegaard), ‘Genealogy of Morals’, ‘Life without Principle’ and ‘Walden’ (both references to Henry David Thoreau) and ‘Twilight of the Idols’, one of the last texts written by one of Shaun’s philosophical idols, Friedrich Nietzsche. ‘Genealogy of Morals’ – part of a series designed to reflection Shaun’s interest in philosophy. “Hill Farmstead opened in March 2010 with just one employee, me, although I guess technically you have to be paying yourself to be considered an employee. We’re in northern Vermont, about 45 minutes from the Canadian border. At the time that we opened I think there were just less than 2000 breweries in the United States. It’s likely to hit 6000 breweries now I think maybe by the end of the year. My dedication and overall sense of place is what has encouraged me to open the brewery here. My family co-founded the town of Greensboro in the 1780s. They were one of the original families to get a land grant here. I often say I didn’t choose to put a brewery here, that the place chose me, which is very true. It’s difficult to talk about Hill Farmstead without also talking myself and my own experience because, even though we now have 17 employees, Hill Farmstead is still an extension of me, even though I’m trying to undergo a process of differentiation. Separating myself from this child, which is not that easy. Not because I don’t want to, but because it’s not ready to be separated. I started home brewing when I was 15 years old. I did a high school science fair on fermentation, I’ve always been fascinated by beer and fermentation. It’s taken me round the world several times, and the highlight for me was leaving my multiple Head Brewer jobs in the United States here in Vermont to move to Copenhagen where I lived for just short of two years. I often reference the fact that I hit my 10,000 hours in Copenhagen, and that was kind of the point where you stop thinking so much about all the mechanics of how to make this thing correct, and everything just sort of flows from you because it’s an extension of yourself. Like driving a car or something. I returned from Copenhagen in November 2009 and I’d met all the people I’d needed to, to raise a little bit of money. A very, very little bit of money, to open this brewery and get our first batch of beer in the tanks on March 30, 2010. I live in the house that’s 30 feet away from the brewery still. My primary focus in a beer is the mouthfeel. To me that’s one of the most important characteristics and it’s quite often what is wrong with 95 plus percent of “craft beer”. I also believe that craft beer doesn’t exist, there’s no such thing. Beer is beer. My Founding Statement says the goal is to craft “succinct and elegant beers of distinction”. For me the best beers are the ones that really seem most luxurious. A very good friend of mine once said that “luxury is emotion”. Some of the things that we feel most captivated by are the things that really evoke an emotional response. At least for quite a long period of time, the reason our brewery gained a claim was that a lot of other people weren’t trying to brew beers that were captivating and luxurious and evoking an actual emotional response. Hill Farmstead in 2010, was quite symbolic. It will be interesting 20 years from now to write a book about how all these little things that exist in beer all hinged around that time in 2010, 2011 and I was at the right place at the right time. But, yeah, people weren’t brewing beer to captivate the imagination really. Now the bulk of new breweries in America are imaginative and trying to captivate the senses. Shaun branding one of the brewery’s oak casks. But the shift that has occurred is that back then everything I was doing was born out of authenticity. When I said this is a luxurious beer, it was a luxurious beer. Now we’ve entered the post-modern turn, where someone who’s not making a good beer can say this is a luxurious beer and then people believe them. You see the parallels? The government is doing the same thing, right? So now there is some collusion. I feel like consumers are really being manipulated. People have a very high degree of self-import and they believe that the beer that they’re making is better and more important than it actually is. “Dollar signs, man, that’s the difference. The difference between brewing even 7 years ago and brewing in 2017 is that there was no money in beer 10 years ago. It was a sacrifice. You were lucky to make $20,000. Maybe get the right job, making $30,000 a year. But you didn’t care. You had enough because you spent most of your life at work, then you take your beer home from the brewery, you make dinner and go to sleep and do it all over again. It was truly a labour of love then and beer is no longer a labour of love in this sort of modern entrepreneurial turn. It’s like labour of love, but now there’s this new turn which to me symbolises decadence, the point where there’s co-option and manipulation. It used to be 7 years ago I couldn’t find a bank to loan me money, even $10,000 to buy a fermenter. Now banks are loaning millions of dollars to people who are just home brewers! At the point that that shift occurs, the reasons for people entering beer are different. When the barriers to entry are reduced, such as funding, cost of equipment, government regulations, etc. the floodgates totally open. To us that have spent the last 20 plus years trying to refine what it is that we do, and it’s an extension of self, it doesn’t feel very good. “The difficulty in the age of fake news and this Orwellian spin world we live in is that just because something looks authentic, doesn’t mean that it is. Even if people tell you they are authentic, that’s also not right. So maybe you should also question me, I don’t know… We’re in an age where people can pay people to market for them. A brewery that looks like it’s bootstrapped and thrown together has $100,000 marketing budget so that they hit the ground running, right? Also not authentic. To date, as of now, May 12, 2017, I have never in the history of this brewery spent a dollar on marketing, and I have no intention to. To me that’s also a form of authenticity I think. There was an interview that I just listened to that I did back in 2014 where I was talking about spirit. I was talking about the manipulation of words and terms in the world of beer, and how terms like ‘rustic’ and ‘artisanal’, and now even the word ‘authentic’, those words mean nothing because they’ve been co-opted so much. The word ‘farmhouse’. You don’t have to be in a farmhouse to make a farmhouse beer. Things become so empty that it makes it difficult to choose a path forward, because you know you’re not empty and you’re trying to move forward, but you’re like, “Oh, I can’t use that word, can’t use that word, can’t use that word” and there’s this point ahead – I think it comes after the decline or decadence have begun – in which spirit itself eventually has to reflect upon itself. “No-one is talking about the decline of craft beer in terms of manipulation of language, co-option of imagination. But no-one is really imaginative any more. Nothing new can be done. I’m sure you’ve read Rilke? There’s a great quote in Letters to a Young Poet, something like “All great art is borne out of necessity”. One of my favourite quotes. That’s what I feel about this place and all of my greatest beers, things I love the most, they really are borne out of necessity. But when people are opening a brewery with millions of dollars in investment, and they’re just mimicking the people who they want to emulate, it’s not art, it’s imitation. I’ve also many times now said that whoever said that imitation is the greatest form of flattery, was an imitator. Because if you’re the one being imitated, you do not feel flattered. Now everyone makes a citrus IPA, everyone is making beers that are inspired by the beers that ourselves and other people were making during that period of time. I’m not so sure what the boundaries are to be pushed anymore. I’ve just for that reason been turning inside and thinking about what we can do to make sure that we’re sharing this place with people who come here. So how can we optimise our experience? How can I make sure that employees are actually happy? How can we restructure and make sure that people are living good lives and not overworked? That also takes creativity, but it’s not just putting six different ingredients in a kettle. “Think about Impressionists. Eventually at some point it’s like that work of art is your choice of paint, your choice of canvas. All of the other things that go into that work of art because at some point it’s not just the work of art itself, but it’s every single thing that circulates within it. All of those things require imagination as well. And what about ‘faux imagination’? ‘Faux creativity’?. If we’re in an age where every word almost has lost its meaning and value, what happens when someone claims that they are imaginative, or they even name their project, or their beer, imagination, but there’s no imagination that actually went into it? It’s almost like we need to create a new language. Because of people co-opting those terms, it’s difficult for people who value those things to actually find the things that they themselves know they would value, because you have to walk through a forest of the non-imaginative who claim to be imaginative. I’ve come across things where people are like, “We’ve worked really hard and taken everything we’ve learned to bring you one of the best beers that you can ever consume” and then you open it and it’s wholly disgusting. The industry at the moment is just lacking self-criticism. That’s what’s painful to me. If we make a bad beer, and I’m like, “That’s a bad beer”, I’ll dump it down the drain. $50,000 worth of beer or something. “At points in my life I’ve been more imaginative than others. You know there are weeks where I’m really busy and I’m not making imaginative meals. I’m adding organic frozen peas to a box of organic macaroni and cheese or something. Imagination exists, sure, but when you’re more stressed and your focus is out on the fact that someone is misbehaving or not doing their job, it creates a blockage. Unlike every other staff member here, I do not have a commute to work, really. It takes me less than 20 seconds to commute to work. My brain functions quickly sometimes, but 20 seconds is not enough time. It’s amazing when you have all these things happening around you all day and you finally go on a drive for an hour, you’re just zoning out and all of a sudden, “Like wow, this happened and this means this, and now this, I have to do this. Oh my god, I need to pull over and write this stuff down.” It’s fascinating to hear the Operations Manager talk about how his real goal is to make sure that I can “do my thing” and imagine, and focus on the future and “remain creative and imaginative”, to use his words. I’m able to look forward at impending problems as I see them. Keep in mind that to me a problem can be a flavour that I’m not particularly enthused with in a beer, and how to set up a series of tests for what new flavour we need to explore, or looking at a water analysis and realising that perhaps this one mineral is the secret to making the mouth feel that I want. I don’t know if that’s imaginative. I don’t know if that’s the correct word. It requires an effort of the mind and a leap beyond the immediacy. I will never be at an end point. Nor will where I want Hill Farmstead, or my life with these things, to go really be at an end point. I can’t just resign myself to watching television and saying, “Yup, everything is where I want it to be and that’s good enough”. It will be interesting to use those definitions of creativity and imagination, but it seems to take both of those to maintain oneself on a pathway to enlightenment if you want to use that word. For me beer is very much involved with that pathway. I don’t know where it is on that path. It changes week to week I guess. The Future: a brewery rooted in place? “I would love the United States to become a little more like Germany. In Germany you have 80,000 litre a year breweries where all their beer is sold within a 20 km radius. That is incredible to me. Very localised beer, very localised pubs. But at the same time, you look at what community is in the year 2017, community is not the same. If you go into a pub in the United States, 50% of people are on their smart phones, or more. I don’t know if my ideal or what I wish would exist can actually exist anymore, right? People don’t connect the way that they do in European pubs, although I’m sure that that’s changing as well. Is localisation possible in a global and quick, very impersonal world? For me, being rooted in this place means providing very welcoming jobs and benefits to children of the community. It’s hiring local contractors and gardeners and folks to work on the grounds, buying wood from local saw mills. We’re in quite a rural community so people actually have to drive here, they can’t walk here. The people that are typically coming here are those people who are fascinated with craft beer. Or once in a while tourists that are looking for something to do on a day when they’re out travelling. But other than giving charitable donations to the local community, maybe like employing members of the local community, I’m still trying to figure what the best way is to build community, or interact with the local area. We’re using fruit grown just down the road. There are other farms, employment, grains from a local farm, trying to do charitable things, but things are not the same as they were even 20 years ago. It’s almost like people don’t crave or demand or need that social hub in the same way. And even if there is a social hub, the things that they’re socialising about, no-one’s talking about politics. People forget about beer’s origins or the founding origins of the United States. So much great work, and great conversation, was had in pubs. That’s dwindling. People are not communicating or talking about their political leanings in pubs any more over a pint of beer. I don’t even know if people are really doing it other than in a chatroom. I have a good bit of land here, my brother and I, and we’re thinking do we create a foundation and put everything in a foundation so that nothing can be divided and everything is passed on in perpetuity? How do we extend the focus of Hill Farmstead, which has gone from this to this, to add an educational component, or a very sort of meditative component? If we’re doing anything for people that’s bringing an element of goodness, or quality, or luxury into their lives, it’s that some people are struck by the characters of our beer, and that makes them smile. There is that certain “Je ne sais quoi”-ness, that is something remarkable and captures the imagination. But then when they drink the beer here, especially if they’re coming from Boston or New York City or somewhere, and it’s very quiet, and it’s very peaceful, and there aren’t people yelling and horns, and they’re like “Wow”. ‘Dorothy’, named after Shaun’s grandfather’s sister (1921-1994). In that sense, the quality of the beer that’s capturing their imagination is also in a place that’s capturing the imagination. I’m still trying to figure out how to link that to Greensboro and the North East Kingdom as a whole and what it is I can do with this, to better that. I’m still not sure, other than fundraisers and charity, but that’s not really enough. I think there’s a little bit of a crisis soon to ensue. I’m talking about stress, I think that in particular in the United States, a lot of people are suffering from very undue stress just inflicted by the oligarchy and lack of the ability to accumulate wealth. People working two jobs while also not being able to pay their bills. The only thing that they really have that fulfils them on a daily basis is their imagination. It’s fascinating to think about the fact that no matter how imprisoned you are, if you’re in a prison cell, you still have your imagination and it can’t be taken away. I donate money to a few different programmes in the local area. A couple of years ago we raised money for the local elementary school where I also went. It was $4000 or $8000, I can’t remember, it was four years ago, and my instructions for the earmarking of the funds – I didn’t just want them to go to general operating – were that the funds needed to be used in order to help the children evoke imagination and thought. Ideally dreams. How can this money be used to help young children in this area, who’ve maybe never left this area, realise they can really do anything they want, and go anywhere they want? They can go to the moon if they want to. When you try to think about what you can do to make sure that the future generation is set up for success, does it start in the home? Does it start in school? Is it the media? Is technology ruining the ability for people to imagine? Maybe there just need to be more channels for people to feel okay and safe and comfortable about their imagination. In certain kinds of education, I believe Montessori and Waldorf actually encourage imagination, whereas public school systems, I don’t know, other than the odd art or craft, it’s making sure you can pass the standardised test, you’re not really encouraged to use your imagination. There are a lot of parallels there that I was saying, like entrepreneurs and starting breweries to mimic other people’s breweries. Where’s the imagination? Where’s the imagining happening here? From everything I’ve read about Generation X, or whatever it’s called – the young folk after the Millennials – their set of values is much different than the millennials. They don’t feel entitled, and it seems like the belief is they’re much more encouraged to affect change in the world. But what can we do, as 30s and 40s to make sure that that generation, the next generation is set up for really imagining what the future can be? Title photo by Bear Cieri. His comment about the lack of social conversation in pubs, especially in the US, reminds me of the book, The Great Good Place by Ray Oldenburg. Oldenburg asserts that this Great Good Place, the 3rd Place (the other two places being ‘home’ and ‘work’) is essential for a functioning society. Not having a true 3rd place available to the community (where socializing is the central entertainment) is no less than a threat to democracy. In this context, I wonder if there are no longer local social spaces, what happens to community imagination and what is the follow on effect on individual imagination? Corporations are drawing the life blood from our lives. The thought that a company that lives off of money could be considered an entity is appalling. Although I did agree with a great many things said in this article, the parts that discussed society and community were the most pure. Too many folks in this time have a problem with so and so, and no solutions. The articulation in this article lets me know that I’m not alone, and the future has great potential. I hope the author decides to continue to inspire and show everyone that what they imagine can happen. Thank you.